Applied Reliability Engineering Volume II, 5th Ed. 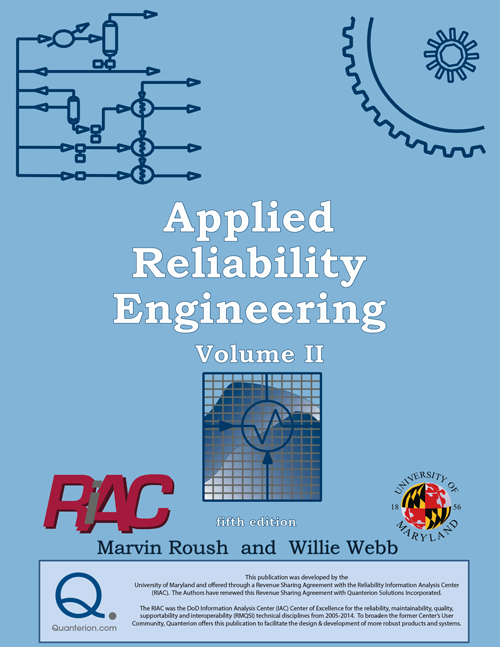 Volume II of the book provides a “systems view” of reliability engineering covering in chapter six the standard techniques for system reliability analysis and simulation. Chapter seven addresses techniques used in designing for reliability and maintainability. Chapter eight introduces renewal theory, condition-based maintenance and other aspects of maintainability analysis. Chapter nine provides a thorough coverage of the various aspects of development and acceptance testing as well as accelerated testing. Chapter ten then describes the design and conduct of reliability management programs. LIMITED QUANTITIES OF HARDCOPY WHILE SUPPLIES LAST.